Figure 3 from Schwarz-Wings et al. 2009. A is Diplodocus, B-D are Giraffatitan. 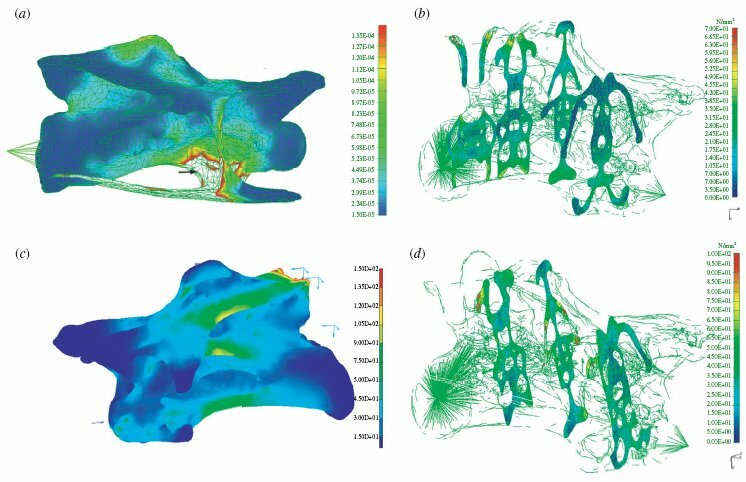 Earlier this month Daniela Schwarz-Wings and colleagues published the first finite element analysis (FEA) of sauropod vertebrae (Schwarz-Wings et al. 2009). Above is one of the figures showing some of their results. Following standard convention, stresses are shown on a gradient with cooler colors indicating lower stresses and hotter colors indicating higher stresses. I’m not going to dwell on the on the nuts-n-bolts of FEA in general or of this study in particular. Instead, I want to talk about how sauropod vertebrae are built. CT cross sections of BYU 12866, a mid-cervical of Brachiosaurus sp. In cross-section, sauropod vertebrae often have thick bone at the outer edges of the laminae and in the walls and especially the floor of the centrum, as shown in this Brachiosaurus cervical. The bone everywhere else is pretty thin. If you hit one of these vertebrae with some magical forumula that would dissolve away all the bone thinner than, say, 1 cm, all that would be left would be the various apophyses, the outer margins of the laminae connecting them, and probably the bottom half of the centrum. It would be like the outline of a vertebra constructed from tent poles, or tinkertoys. This is weird because most pneumatic sauropod vertebrae have at least something approaching an I-beam shape in cross-section. You might think that the median septum would be mechanically important, but it’s usually very thin, sometimes perforated (see Hatcher’s  Diplodocus cervicals, for example), and often asymmetrically deviated to one side or the other. Not what you would expect for a piece of bone that was doing any work. Comparative stresses are distributed evenly around the vertebrae and mainly on the bone cortex. Peak stresses occur only at points where the tendons and muscles are inserting because the insertion areas used were small resulting in extreme localized stresses. The interior of both vertebrae is nearly stress free. Almost no stresses occur around the cavities and in their bony walls (figure 3). This reminds me not of I-beams but of the long bones of the limbs of terrestrial vertebrates. There’s a reason why you’ve got a big honkin’ marrow cavity running through the middle of your femur: the stresses are being borne by the walls of the bone. It makes sense that vertebrae would function similarly, especially sauropod cervicals which sometimes approximate limb bones in their proportions. So how about that median septum? 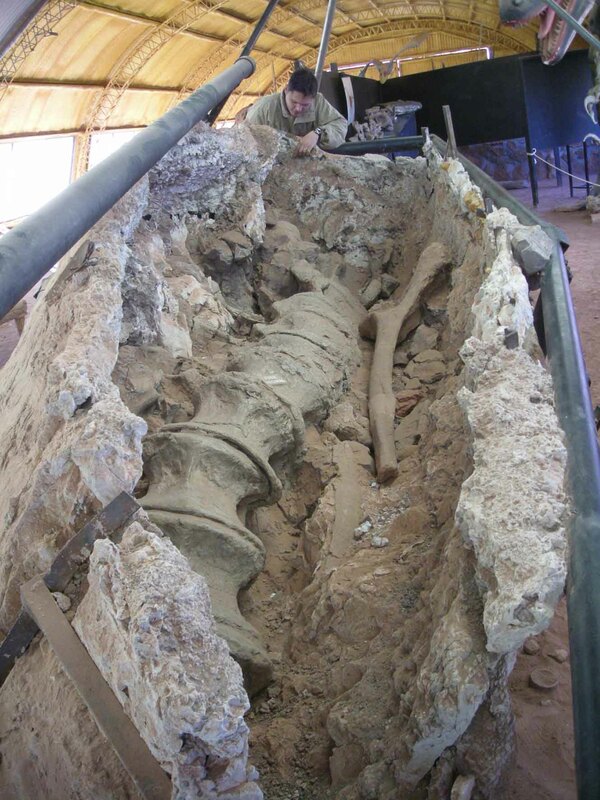 Why aren’t sauropod vertebrae just hollow tubes? My guess–and it is a guess–is that they got as close to being hollow tubes as their evolutionary and developmental origins allowed. The pneumatic diverticula invaded the centra from either side and pushed in lateral-to-medial, and I think the median septum is just the wimpy little bit of bone left in between the two sets of diverticula when they almost meet up in the middle. Even if that’s correct, there’s another mystery: why don’t the diverticula just go ahead and erode away the median septum? I can think of two possible reasons. One is that, for reasons I don’t know and I’m not sure if anyone else does either, pneumatic diverticula are good at getting into bones but pretty lousy at getting back out. There are comparatively few cases of diverticula inside bones making foramina to get out into the surrounding tissue. It does happen–in humans, the mastoid air cells sometimes bust out and make subcutaneous pneumatocoels, basically bubbles of air under the skin (Anorbe et al. 2000)–but it seems to be rare. Maybe median septa fall under the same inscrutable rule. Another, more mundane possibility is that the median septa (and other oddly thin bits of bone) are not never loaded, just infrequently loaded. Not enough to make them straight, thick, or normal-lookin’, but enough to make sure they don’t get resorbed entirely. 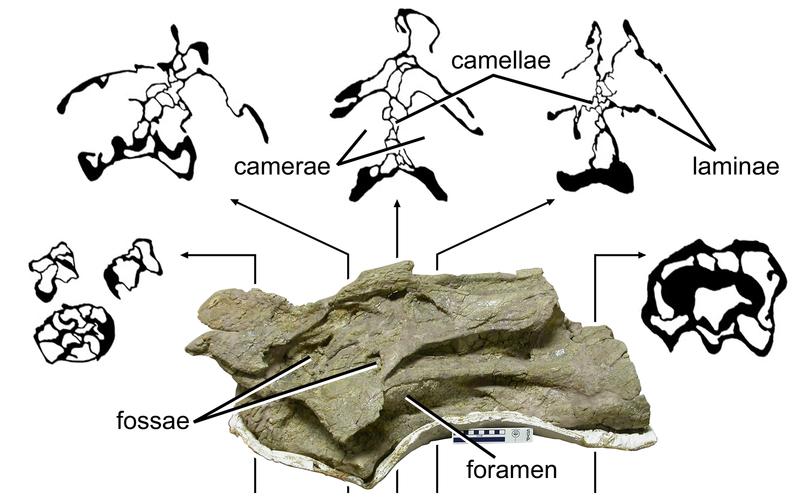 Sauropod vertebrae are just loaded with these growth-and-form-related mysteries. Kudos to Schwarz-Wings et al. for pushing us a little farther down the road toward solving them. Hatcher, J.B. 1901. 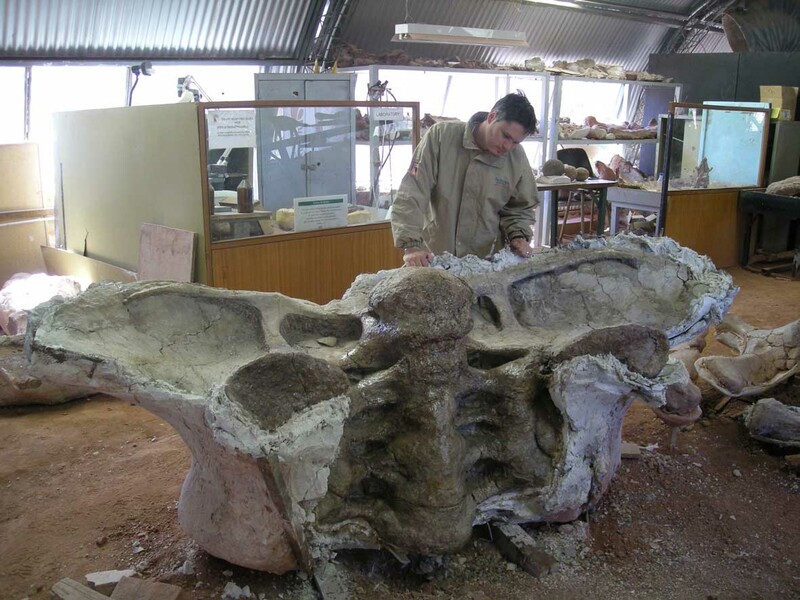 Diplodocus (Marsh): its osteology, taxonomy and probable habits, with a restoration of the skeleton. Memoirs of the Carnegie Museum 1: 1-63 and plates I-XIII. How big were the biggest sauropod trackmakers? I screwed up, seriously. Tony Thulborn writes in a comment below to correct several gross errors I made in the original post. He’s right on every count. I have no defense, and I am terribly sorry, both to Tony and to everyone who ever has or ever will read this post. He is correct that the paper in question (Thulborn et al 1994) does discuss track length, not diameter, so my ranting about that below is not just immoderate, it’s completely undeserved. I don’t know what I was thinking. I did reread the paper before I wrote the post, but I got the two switched in my mind, and I assigned blame where none existed. In particular, it was grossly unfair of me to tar Tony’s careful work with the same brush I used to lament the confused hodgepodge of measurements reported in the media (not by scientists) for the Plagne tracks. I am also sorry that I criticized the 1994 paper and implied that the work was incomplete. I was way out of line. I regard this post as the most serious mistake in my professional career. I want very badly to somehow unmake it. I am adding corrections to the post below and striking out but not erasing my mistakes; they will stand as a reminder of my fallibility and a warning against being so high-handed and unfair in the future. I’m sorry. I beg forgiveness from Tony, from all of our readers, and from the broader vertebrate paleontology community. Please forgive me. 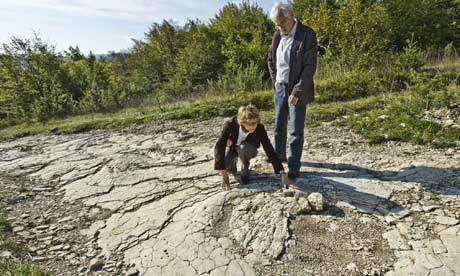 You might have seen a story last week about some huge sauropod tracks discovered in Upper Jurassic deposits from the Jura plateau in France, near the town of Plagne. According to the news reports, the tracks are the largest ever discovered. Well, let’s see. The Guardian (from which I stole the image above) says the prints are “up to 2 metres (6ft 6 in) in diameter”, but ScienceDaily says “up to 1.5 m in total diameter”. Not sure how ‘total diameter’ is different from regular diameter, but that’s science reporting for you. The BBC clarifies that, “the depressions are about 1.5m (4.9ft) wide”, which might be the key here (see below), but then mysteriously continues, “corresponding to animals that were more than 25m long and weighed about 30 tonnes.” I find it rather unlikely that a pes track 1.5 m wide indicates an animal only as big as Giraffatitan (hence this post). So there’s some uncertainty with respect to the diameter of the tracks–half a meter of uncertainty, to be precise. But sauropod pes tracks are usually longer than wide, and a print 1.5 m wide might actually be 2 m long. I’ll feel a lot better about the Plagne tracks when the confusion about their dimensions is cleared up and when some evidence is presented that they also are not underprints. In any case, the only dimension with any orientation cited for the Plagne tracks is the 1.5 m width reported by the BBC, so we’ll go with that. So the Plagne tracks might only tie, but not beat, Thulborn’s tracks. Nevertheless, for the remainder of this post we’ll accept that at least some sauropods were leaving pes prints a meter and a half wide. Naturally, it occurs to me to wonder how big those sauropods were. 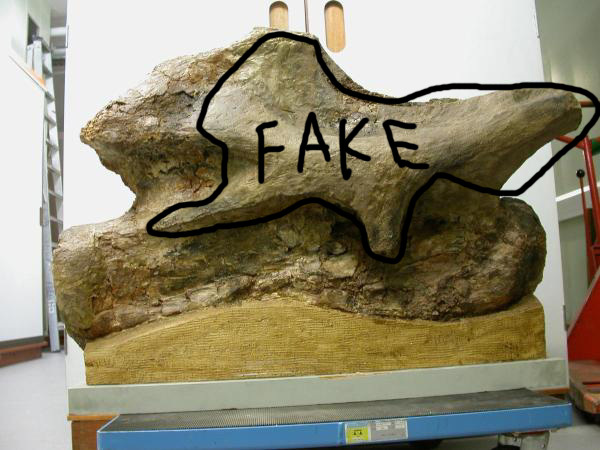 I don’t know of any studies that attempt to rigorously estimate the size of a sauropod from its tracks or vice versa, so in the finest tradition of the internet in general and blogging in particular, I’m going to wing it. First we need some actual measurements of sauropod feet. When Mike and I were in Berlin last fall (gosh, almost a year ago! ), we measured the feet (pedes) of the mounted Giraffatitan and Diplodocus for this very purpose. The Diplodocus feet were both 59 cm wide, and the Giraffatitan feet were 68 and 73 cm wide. The Diplodocus feet are trustworthy, the Giraffatitan bits less so. Unfortunately, the pes is the second part of the skeleton of Giraffatitan that is less well known than I would like (after the cervico-dorsal neural spines). The reconstructed feet look believable, but “believability” is hard to calibrate and probably a poor predictor of reality when working with sauropods. One thing I won’t go into is that Giraffatitan (HM SII) probably massed more than twice what Diplodocus (CM 84/94) did, but on the other hand G. bore more of its weight on its forelimbs. It would be interesting to calculate whether the shifted center of mass would be enough to even out the pressure exerted by the hindfeet of the two animals; Don Henderson may have done this already. Anyway, let’s say for the sake of argument that the hindfeet of the mounted Giraffatitan are sized about right. The next problem is figuring out how much soft tissue surrounded the bones. In other words, how much wider was the fleshy foot–deformed under load!–than the articulated pes skeleton? I am of two minds on this. On one hand, sauropods probaby had a big heel pad like that of elephants, and it seems reasonable that the heel pad plus the normal skin, fat, and muscle might have expanded the fleshy foot considerably beyond the edges of the bones. On the other hand, the pedal skeleton is widest across the distal ends of the phalanges, and in well-preserved tracks like the one below the fleshy foot is clearly not much wider than that (thanks, Brian, for the photo!). Bear in mind that a liberal estimate of soft tissue will give a conservative estimate of the animal’s size, and vice versa. Looking at the AMNH track pictured above, it seems that the width added by soft tissue could possibly be as little as 5% of the width of the pes skeleton. Skewing hard in the opposite direction, an additional 20% or more does not seem unreasonable for other animals (keep in mind this would only be 10% on either side of the foot). 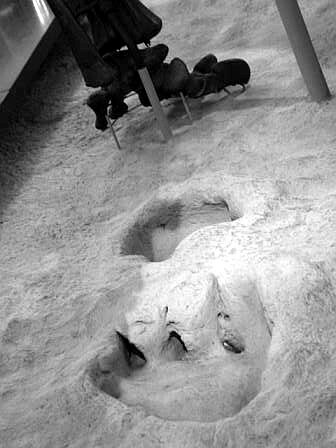 Using those numbers, Diplodocus (CM 84/94) would have left tracks as narrow as 62 cm or as wide as 71 cm. For Giraffatitan (HM SII) I’ll use the wider of the two pes measurements, because the foot is expected to deform under load and the 73 cm wide foot looked just as believable as the 68 cm foot (for whatever that’s worth). Applying the same scale factors (1.05 and 1.20) yields a pes track width of 77-88 cm. These numbers are like pieces of legislation, or sausages: the results are more pleasant to contemplate than the process that produced them. They’re ugly, and possibly wrong. But they give us someplace to start from in considering the possible sizes of the biggest sauropod trackmakers. Something with a hindfoot track 1.5 meters wide would be, using these numbers, conservatively more than twice as big as (2.11x) the mounted Carnegie Diplodocus or 170% the size of the mounted Berlin Giraffatitan. That’s right into Amphicoelias fragillimus/Bruhathkayosaurus territory. The diplo-Diplodocus would have been 150 feet long, and even assuming a very conservative 10 tons for Vanilla Dippy (14,000L x 0.7 kg/L = 9800 kg), would have had a mass of 94 metric tons (104 short tons). The monster Giraffatitan-like critter would have been “only” 130 feet long, but with a 14.5 meter neck and a mass of 113 metric tons (125 short tons; starting from a conservative 23 metric tons for HM SII). Keep in mind that these are conservative estimates, for both the size of the trackmakers and the masses of the “known” critters. If we use the conservative soft tissue/liberal animal size numbers, the makers of the 1.5 meter tracks were 2.4 times as big as the mounted Diplodocus or almost twice as big as the mounted Giraffatitan, in which case masses in the blue whale range of 150-200 tons become not just probable but inevitable. 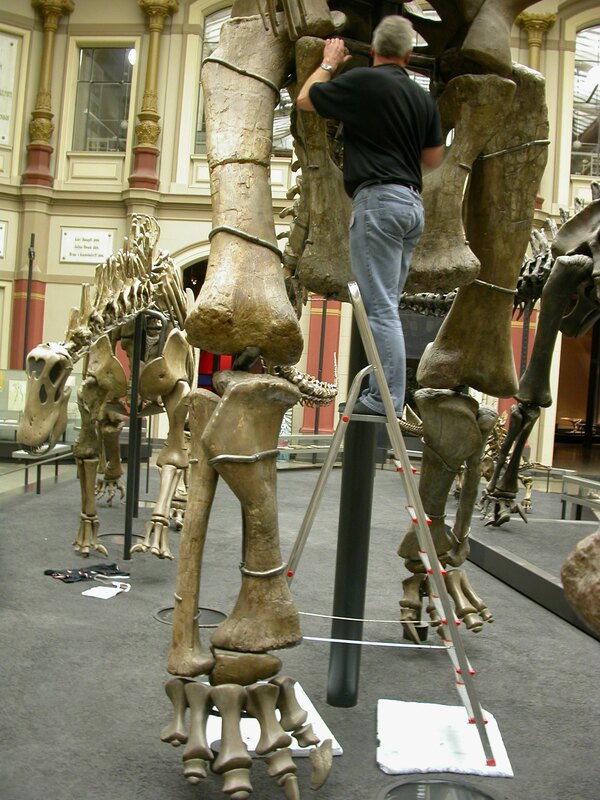 Mike measuring Giraffatitan's naughty bits. Check out the hindfeet. Also note the sauropod vertebrae in the background--titular obligation fulfilled! First, the pes of Giraffatitan might have been bigger than reconstructed in the mounted skeleton. Looking at the photo above, I can image a pes 10% wider that wouldn’t do any violence to the “believability” of the mount. That would make the estimated track of HM SII 10% wider and the estimated size of the HM-SII-on-steroids correspondingly smaller. But that wouldn’t affect the scaled up Diplodocus estimate, and the feet of Giraffatitan would have to be a LOT bigger than reconstructed to avoid the reality of an animal at least half again as big as HM SII. Third, I suppose it is possible that sauropod feet scaled allometrically with size and that big sauropods left disproportionately big tracks. I’m also not worried about this. For one thing, when they’ve been measured sauropod appendicular elements tend to scale isometrically, and it would be weird if feet were the undiscovered exception. For another, the allometric oversizing of the feet would have to be pronounced to make much of a dent in the estimated size of the trackmakers. I find the idea of 100-ton sauropods more palatable than the idea of 70-ton sauropods with clown shoes. Fourth, the meta-point, what if the Broome and Plagne tracks are underprints? [Please see Tony Thulborn’s comment below regarding footprints and underprints.] I’ve seen some tracks-with-undertracks where the magnification of the apparent track size in the undertracks was just staggering. The Broom tracks have gotten one brief note and The Plagne tracks have not been formally described at all, so all of this noodling around about trackmaker size could go right out the window. Mind you, I don’t have any evidence that the either set are underprints, and at least for the Broome tracks the evidence seems to go the other way, I’m just trying to cover all possible bases. So. Sauropods got big. As usual, we can’t tell exactly how big. Any one individual can leave many tracks but only one skeleton, so we might expect the track record to sample the gigapods more effectively than the skeletal record. Interestingly, the largest fragmentary skeletal remains (i.e., Amphicoelias and Bruhathkayosaurus, assuming they’re legit) and the largest tracks (i.e., Plagne and Broome) point to animals of roughly the same size. Finally, IF the biggest fragmentary gigapods and the biggest tracks are faithful indicators of body size, they suggest that gigapods were broadly distributed in space and time (and probably phylogeny). I wonder if these were representatives of giga-taxa, or just extremely large individuals of otherwise vanilla sauropods. Your thoughts are welcome. It’s past time someone set the record straight about damn Breviparopus. The oft-quoted track length of 115 cm is (A) much smaller than either the Broome or Plagne tracks, and (B) the combined length of the manus and pes prints together; I know, I looked it up (Dutuit and Ouazzou 1980). Why anyone would report track “length” that way is beyond me, but what is more mysterious is why anyone was taken in by it, since the width of 50 cm (pathetic!) is usually quoted along with the 115 cm “length”, indicating an animal smaller than Vanilla Diplodocus (track length is much more likely than width to get distorted by foot motions during locomotion) [This part is wrong; see the update below.]. But people keep stumbling on crap (thanks, Guiness book!) about how at 157 feet long (determined how, exactly?) 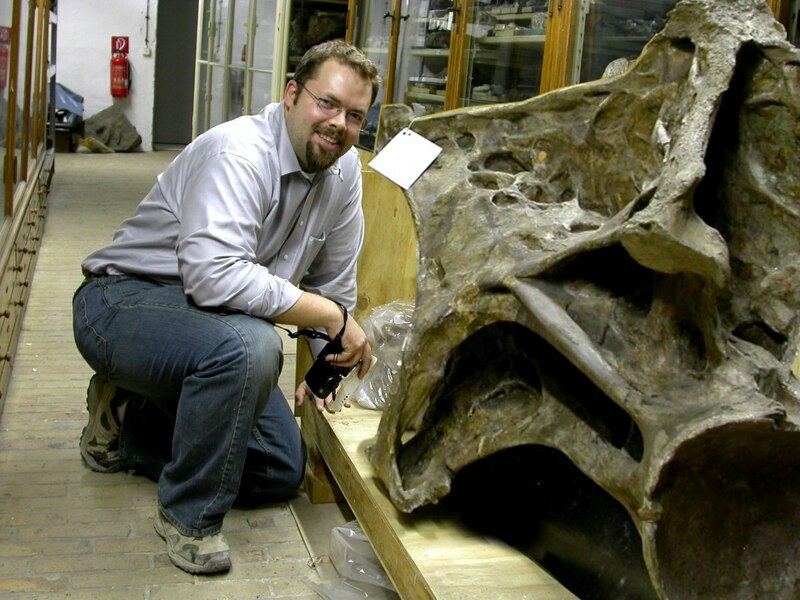 Breviparopus was possibly the largest critter to walk the planet. Puh-leeze. If there’s one fact that everyone ought to know about Breviparopus, it’s that it was smaller than the big mounted sauropods at museums worldwide. The only thing super-sized about it is the cloud of ignorance, confusion, and hype that clings to the name like cheap perfume. Here’s the Wikipedia article if you want to do some much-needed revising. UPDATE (Nov 17 2009): The width of the Breviparopus pes tracks is 90 cm, not 50 cm. The story of the 50 cm number is typically convoluted. Many thanks to Nima Sassani for doing the detective work. Rather than steal his thunder, I’ll point you to his explanation here. Point A above is still valid: Breviparopus was dinky compared to the Broome and Plagne trackmakers. You know I ain’t gonna raise the specter of a beast 1.7 times the size of HM SII without throwing in a photoshopped giant cervical. 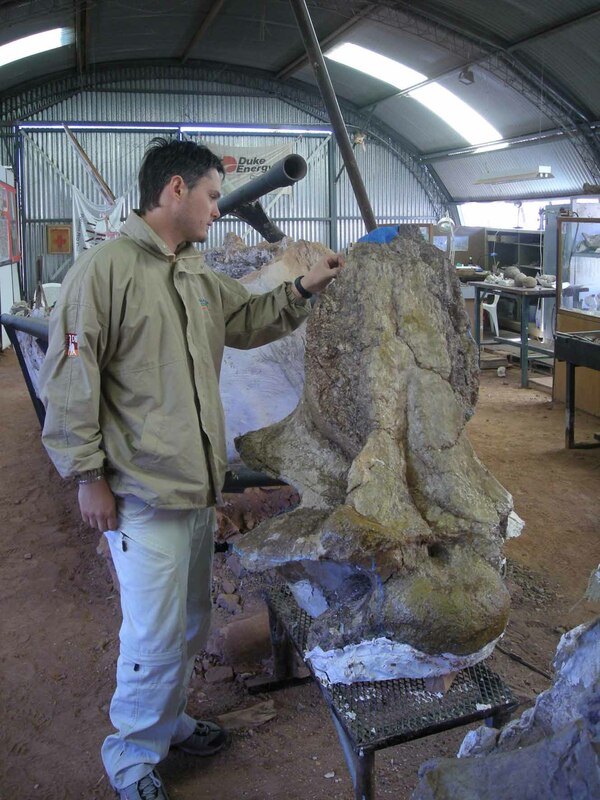 So here you go: me with C8 of Giraffatitan blown up to 170% (the vert, not me). Compare to unmodified original here. Dutuit, J.M., and A. Ouazzou. 1980. 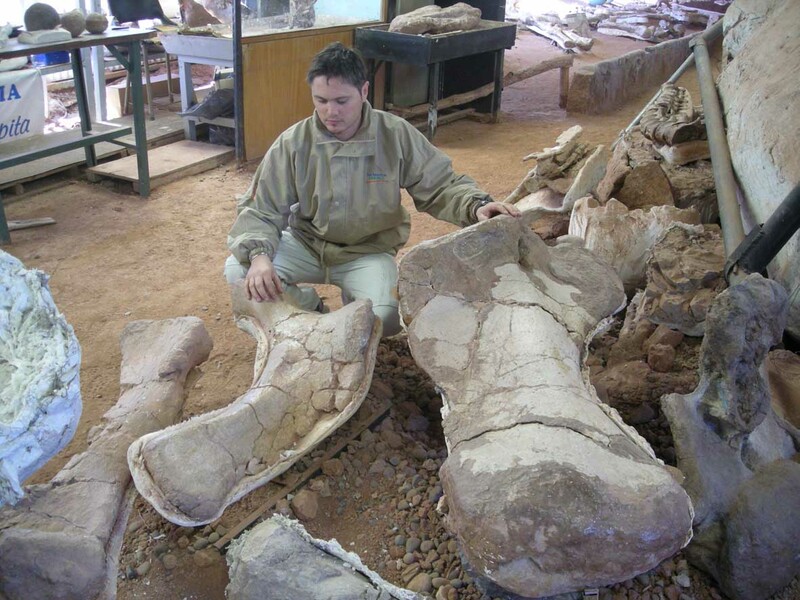 Découverte d’une piste de Dinosaure sauropode sur le site d’empreintes de Demnat (Haut-Atlas marocain). Mémoires de la Société Géologique de France, Nouvelle Série 139:95-102. Thulborn, R.A., T.Hamley and P.Foulkes. 1994. Preliminary report on sauropod dinosaur tracks in the Broome Sandstone (Lower Cretaceous) of Western Australia. Gaia 10:85-96. One of the most bizarre of sauropods – and arguably one of the most bizarre of dinosaurs – is the Patagonian dicraeosaurid diplodocoid Amargasaurus cazaui Salgado & Bonaparte, 1991. 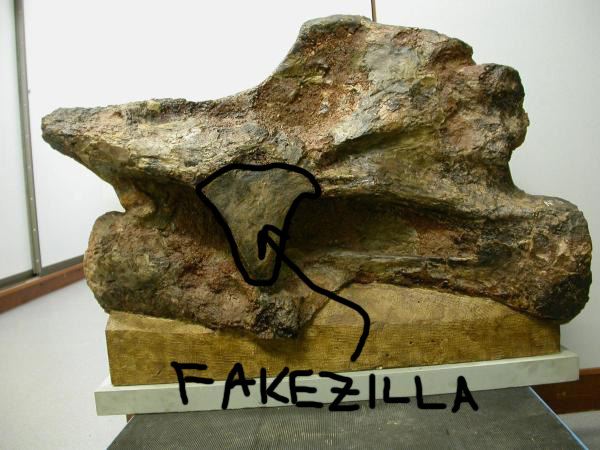 Here’s a picture of a replica specimen, provided by Nizar Ibrahim. You’ll note that this skeleton has been posed with an extended cranio-cervical junction, and a slightly extended cervico-dorsal junction: virtually the opposite of what you’d expect in ‘normal’ posture (Taylor et al. 2009). Thanks to its appearance in virtually every post-1991 book on dinosaurs, Amargasaurus is a relatively familiar animal these days, which is sort of a shame: we’ve somehow forgotten how frikkin’ weird it is. We’ve looked at Amargasaurus on SV-POW! 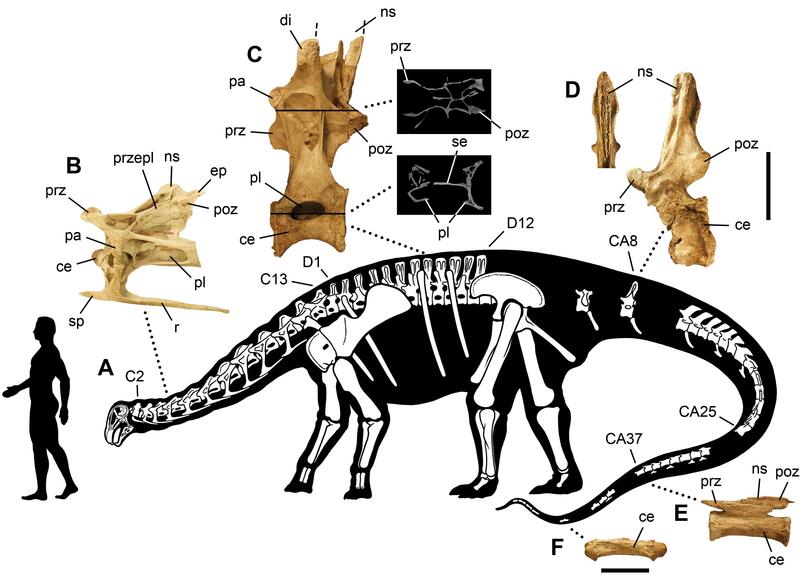 before: in this article we drew attention to the fact that its dorsals are pretty interesting too, and as usual with sauropods we could write whole essays on all manner of its vertebral osteology. Perhaps, in time, we will. However, let’s be honest and note that it’s those ridiculous cervical spines that keep us awake at night. What the hell did the animal do with these structures, and exactly what did it look like when alive? Early reconstructions (most notably Brian Franczak’s drawing from 1992 (see Hecht 1992)) all went with the idea of two paired sails, running in parallel along the length of the neck. All artists thereafter followed suit. Until 1994, when Greg Paul noted that the circular cross-sections of the spines and tapering tips might suggest that the paired neural spines instead protruded from the neck as horn-covered spikes (Paul 1994). Greg also suggested that having paired sails along the neck might be a really bad idea as it could restrict neck mobility, but this idea never made much sense as the tissue between the spines would presumably be flexible and hence not such a problem (the circular cross-section is not really a problem either, since other animals that are thought to have had skin sails, like Dimetrodon, also have rounded neural spines). Since 1994 few opinions have been expressed on this subject, but those that have have sided with Greg in noting that spines are more likely than sails (Salgado 1999). At SVP Bristol last month, your favourite blog authors spent many happy hours discussing sauropods and their vertebrae. And, inevitably, the subject of Amargasaurus and its weird cervical spines came up. Fact is, sails AND spines are both equally stupid, and the idea of independent neck spines is particularly stupid because animals just don’t ever have their neural spines poking out beyond the musculature and skin of the neck. Right? Wrong. Hardly known and rarely mentioned is that the last four (or so) cervical neural spines and first three thoracic spines of the Potto Perodicticus potto (a peculiar African strepsirrhine primate, closely related to the Asian lorises) protrude from the skin of the neck and shoulders, have sharply pointed tips, and are usually stated to serve a defensive function [potto skeleton above provided by Mo Hassan]. The spines don’t protrude as naked bone (though this was claimed by Ivan Sanderson), but are covered with skin and some hair, and form a series of tubercles in the live animal. When threatened, a potto is supposed to hide its head and point those protruding neck spines towards the danger, sometimes even butting the predator or aggressor with the spines. Other functions have been suggested for the spines, but a defensive function remains most popular and in the absence of any special knowledge I’ll go with the majority. At left, Potto with flexed neck, showing its cervical and thoracic spines. From Walker (1970). At right, Amargasaurus as reconstructed by Salgado (1999). Salgado imagined this to be the animal's normal posture: an idea that we find somewhat unlikely (see Taylor et al. 2009). You might wonder, quite reasonably, whether the anatomy of a small arboreal modern primate has any bearing whatsoever on the soft-tissue morphology of a Cretaceous sauropod (even a ‘small’ one). The point is, however, that neural spines can protrude from the neck after all (albeit sheathed in skin and other tissue), and hence there is at least some precedent for this sort of thing. All that’s needed now is for someone to study the histology and microscopic surface texture of those protruding potto spines and see if there are any correlates for their protruding nature (so far as I can tell this hasn’t been done). Then go look at Amargasaurus. There’s clearly a paper in this, please report back and include me on the authorship, thanks. Hecht, J. 1992. Dollars for dinosaurs. New Scientist 136 (1845), 50. Paul, G. S. 1994. Dinosaur art & restoration notes: dicraeosaurs. The Dinosaur Report Summer 1994, 8. Salgado, L. 1999. The macroevolution of the Diplodocimorpha (Dinosauria; Sauropoda): a developmental model. Ameghiniana 36, 203-216. Walker, A. 1970. Nuchal adaptations in Perodicticus potto. Primates 11, 135-144. While we were looking the other way, the digital revolution has happened: everyone but the ICZN now accepts electronic publication. The Code is aﬀorded legitimacy by workers and journals only because it serves them; if we allow it to become anachronistic then they will desert it – or, at best, pick and choose, following only those provisions of the Code that suit them. Facing this reality, the Code has no realistic option but to change – to recognise electronic publishing as valid. I have no detailed recommendations to make regarding the recently proposed amendments to the Code (ICZN, 2008). Instead I ask only this simple question: will the Code step up to the plate and regulate electronic publications as well as printed publications? Because this is the only question that remains open. Simply rejecting electronic publication is no longer a valid option. Which I’m sure is familiar rhetoric to long-time SDF advocates, but which I hope will rattle a few cages in the more conservative ranks of specialist taxonomists. I think it’s a very promising sign that BZN, the official journal of the ICZN, is prepared to publish this kind of advocacy — they didn’t even ask me to tone down the language. I hope it indicates that in high places, they are sensing which way the wind is blowing. Sereno et al. (2007:fig. 3): Nigersaurus taqueti, including photographs of cervical, dorsal and caudal vertebrae in left lateral view. Let me remind you that this was a paper about skulls — vertebrae were not even on the agenda. Yet click through the image (go on, you have to) and you will see them each presented in glorious high-resolution detail. That paper was of course published in the PLoS ONE — a journal that, because it is online only, can provide this quality of figure reproduction, which shames even the very best of printed journals. To see printed-on-paper figures this detailed and informative, you have to right back to Osborn and Mook (1921). Which is why I recently decided to put my open-access money where my electronic-only mouth is, and submit the forthcoming Archbishop description to a PLoS journal. In response to a challenge from Andy Farke, I rather precipitately made a public commitment to do my level best to get that paper submitted this calendar year; and while that may not actually happen, having that goal out there can only help. Seeing that gorgeous quarry photo of Spinophorosaurus was what tipped me over the edge into wanting to use PLoS. My plan is to describe the living crap out of that bad boy, photograph every element from every direction and put the whole lot in the paper — make the paper as close as possible as a surrogate for the specimen itself. Only PLoS (to my knowledge) can do this. I leave you with two photos of “Cervical P” of the Archbishop; commentary by Matt. These images are copyright the NHM since it’s their specimen. Unnamed brachiosaurid NHM R5937, "The Archbishop", Cervical P in right lateral view. Unnamed brachiosaurid NHM R5937, "The Archbishop", Cervical P in left lateral view. International Commission on Zoological Nomenclature. 2008. Proposed amendment of the International Code of Zoological Nomenclature to expand and refine methods of publication. Zootaxa 1908: 57-67, Bulletin of Zoological Nomenclature 65(4): 265-275 and various other places.